Schaeffler UK was part of the team that successfully completed the replacement of the main trunnion bearings on a BOS (Basic Oxygen Steelmaking) plant at Tata Steel Port Talbot. By replacing the drive-side trunnion bearings with split rolling bearings, Schaeffler also helped to save the customer five extra days of work. If solid rather than split bearings had been used, the customer would have had to disassemble the bull gear unit (i.e. the main drive unit for the BOS plant vessel). TATA Steel Port Talbot has two BOS Steel making vessels (V1 & V2) in operation. The original vessel was installed in the late 1960s by UK company Ashmore, Benson, Pease & Co and was subsequently upgraded in 1991/1992 by Mannesmann Demag, including trunnion bearing replacements. Each vessel has a steel making capacity of 330 tonnes. Loss of operation of a BOS vessel would result in significant lost revenue for Tata Steel. In July 2011, Schaeffler UK received a telephone call from an area works engineer at the BOS Plant, advising of a sudden bearing failure on the non-drive side (NDS) of the V2 BOS plant vessel. The BOS Plant engineers arranged a meeting and a request was made for two engineers from Schaeffler Germany to be on site at Port Talbot soon afterwards. A meeting subsequently took place at Port Talbot to discuss action plans and how to replace the trunnion bearings. “The standard ‘solid’ bearing on the DS was replaced by a special FAG split spherical roller bearing [SSRB], which is the recommended replacement spare, as this reduces the amount of downtime when installing the replacement bearing. The NDS bearing was to be replaced with a similar solid bearing. In addition, various surrounding components also required replacing, once the secondary damage caused by the bearing failure had been identified,” confirmed Wall. 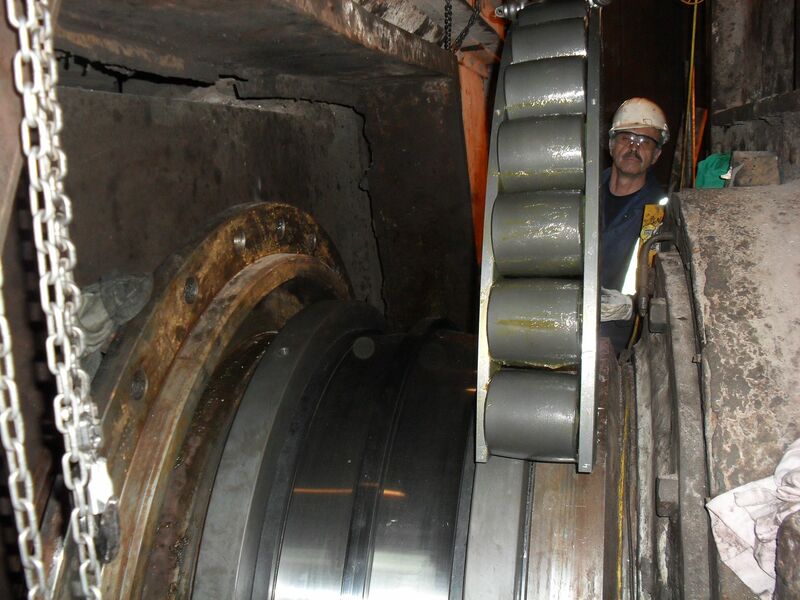 The cutting away of the existing bearing took a total of 36 hours. The distance between the trunnion spacers (bearing seating width) was measured in order to determine the thickness required for two special, TATA designed, split ‘dovetail’ spacers. These were required to ensure that the new split bearing would be correctly secured in place. The new split SRB inner ring halves with clamping rings, outer ring half and bottom roller cage halves, were fitted without any problems. The original bearing on the NDS had failed during operation, which had caused the BOS converter to drop down. It was now resting on the bearing housing and the housing covers. After lifting, parts of the damaged bearings were removed, including cage pieces; outer and inner ring fragments and rolling elements. All the components were sent for forensic examination to TATA Central Engineering Metallurgy & Inspection Dept. The housing back cover, bearing pressure plate and sleeve spacer were found to be seriously damaged. New ones had to be urgently manufactured by Tata Steel’s Central Engineering Shops (CES). The bearing inner ring had disintegrated and the sleeve had to be cut off due to its deformed shape. After removing the damaged bearing, it was also discovered that the trunnion back spacer was in need of repair. Again, machining work was urgently carried out by CES. Due to the subsequent damage to the bearing housing, Schaeffler expertise was required to manually repair this surface to restore it back to an acceptable condition. During the dismounting process the NDS Ladder Expansion Bearing Rollers had to be replaced. To facilitate the Ladder Roller replacement and installation of a TATA manufactured solid inner bearing housing cover, the bottom half of the housing had to be moved away from the journal using specially manufactured crossbeams. The new bearing was first pre-mounted to determine the correct sleeve spacer width. The bottom half of the housing was then moved back into position and the crossbeam construction removed. Mounting of the new bearing was challenging, as the collapse of the original bearing had caused the vessel to move out of alignment. 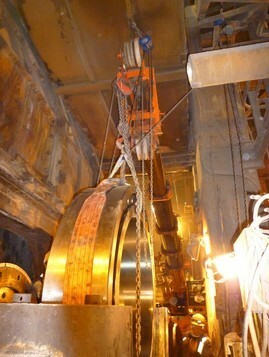 The lowering of the converter was also a challenge as the vessel had to be moved sideways by 40mm to achieve the correct installation position. Side shifting was initially a problem for the vessel lifting contractor but the problem was successfully overcome. For the DS bearing, the remaining roller cage and outer ring halves were installed. For both bearings, the housing caps were fitted and each bearing was 100 per cent filled with grease, including the surrounding free space. The housing covers were bolted in position and new seals with their tensioning devices were fitted. After having successfully completed the work in under 2 weeks, Schaeffler engineers were pleased to be leaving behind a very happy customer. After the bearings were installed, the work didn’t finish there. Schaeffler UK prepared a recommended practical maintenance schedule list and forwarded this to the BOS Engineers, which was well received. In addition, customer “as built” cross-sectional drawings were updated to show the actual parts (with measurements) now in place at V2. Schaeffler UK participated and contributed to the Bearing Failure Review meetings with Tata Steel that followed the bearing replacement for the BOS vessels. “Since replacing the trunnion bearings, engineers from Schaeffler UK have also supervised two further BOS vessel bearing changes in a very short timeframe of just two months: Converter C at SSI UK / Teesside and Converter 1 at Tata Steel Port Talbot. Schaeffler has now been selected as the preferred supplier of main trunnion bearings for the two BOS plant vessels at Tata Steel Port Talbot,” confirms Dave Wall. For more information, please call the Schaeffler UK Marketing Department on 0121 313 5870. Alternatively, email info.uk@schaeffler.com.